Colder months does not mean giving up your herb gardening. Winter herb gardening is rewarding and provides fresh herbs year-round. There is a good selection of herbs to grow in the winter that do well in containers. Gardeners can continue growing herbs in the winter outdoors in warmer growing zones that do not experience winter frost or freezing inclement weather. Gardeners have a large selection of mint herb plants for different flavor combinations. Mint grows heartily throughout the year for indoor container herb gardens. Mint plants require a good deal of moisture and partial shade to thrive. In warmer climates that do not experience freezing temperatures during the winter, mint herbs grow well outdoors. Texas A&M recommends the base of downspouts for a mint planting area. Basil grows well indoors for the winter in well-drained containers. Line the bottom of containers with porous material to encourage draining and prevent root rot. Set basil containers in a sunny window for a minimum of 6 hours of full daily sunlight. Another option is to use plant grow lights set approximately 6 inches above the highest basil plant in the container. Organic compost mixed in the potting soil encourages stronger plant growth. Water the basil plants weekly with 1 inch of water, avoiding water contact with the leaves and stems. Chives make a delicious herb to grow in the winter. Chives go well in salads, as toppings for soups and potatoes or dried for a culinary seasoning. According to Organic Gardening, harvest outdoor chives and bring indoors for winter growing. Gardeners should use organically-rich and well-drained soil in potting containers for growing chives. 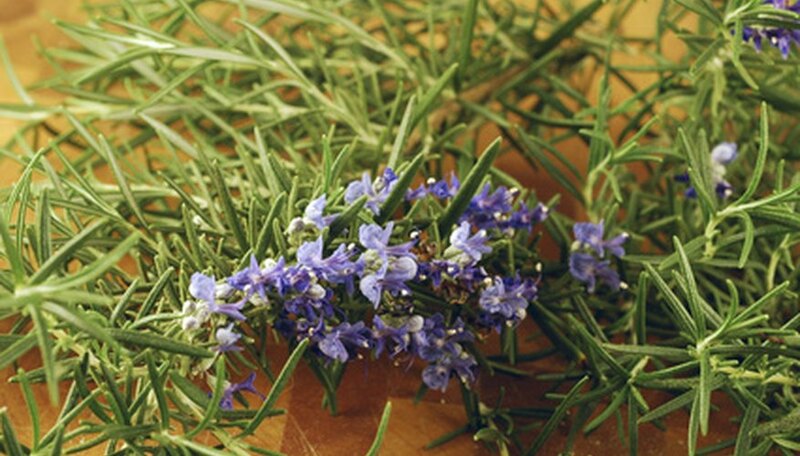 Rosemary is a vigorous herb that does well outdoors or indoors during the winter. Rosemary is often used for meat seasoning. According to The Gardening Patch, rosemary tolerates light frost conditions. Rosemary requires full sun to partial shade, well-drained soil and regular fertilization to grow the best. It is challenging to propagate rosemary from seed due to the low germination rates. Use rosemary seedlings or cuttings to add this herb to your winter gardening areas. Most everyone is familiar with parsley as an edible garnish on plates at restaurants. Parsley requires well-drained soil with a minimum of 6 hours of daily sunlight. Outdoor and indoor parsley requires organic material for the proper soil nutrients to yield the largest crop. Keeping the soil moist is important, but avoid over-watering parsley. Parsley can tolerate some shade during the winter months but tends to grow at slower rates than other months of the year without full sun. Which Herbs Grow Well in North Carolina?